Welcome to Carefree Smile! We are a dental practice in North Scottsdale immediately adjacent to the beautiful Terravita golf and country club community. We are located on Carefree Highway and 60th Street, just across the street from the Desert Foothills YMCA. Although our dental practice is technically located in Scottsdale, our location is at the intersection of Carefree and Cave Creek. We love our beautiful view of the south side of Black Mountain and truly hope you will find it beautiful and relaxing as well. At Carefree Smile, we strive to put your needs first in all that we do, and truly will take the time to get to know you and care for your dental needs. We value each patient and want your visit to be comfortable and relaxing. Our experienced team will do whatever it takes to provide the highest quality dental care in the most comfortable environment. If you are looking for a dentist near Terravita, we hope that you will stop by. We would be happy to provide an initial consult or even second opinion for dental treatment. We see patients of all ages and provide most dental procedures under one roof. Your smile projects your personality to the world! It is our privilege to help you project the most vibrant, beautiful, and confident you! Our mission at Carefree Smile is to help you achieve your optimal oral health and smile. It is our privilege to help your smile project the most vibrant, beautiful, and confident you! 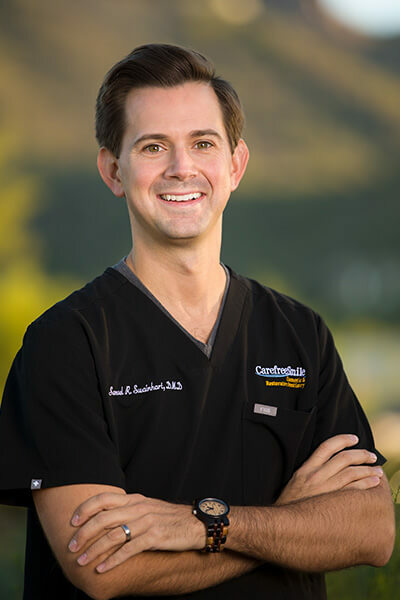 We serve patients in and surrounding North Scottsdale, Carefree, and Cave Creek. We promise to provide the highest-quality dental care for our patients in a safe, comfortable, and empathetic manner. We promise to maintain the highest ethical and professional standards and be trustworthy in all that we do. We promise to dedicate ourselves to our patients and live up to their trust. Our patients will always be first. We practice dentistry with care, comfort, compassion, excellence, respect, safety, and trust. We value our communities of North Scottsdale, Cave Creek, and Carefree. We value our employees. Straighten your teeth without wires and brackets. Ask us about Invisalign. The most comfortable and the most effective professional whitening product available. Dental care for everyone in the family. No insurance? No problem. Save with our membership program.